The Aegadian Islands, meaning ‘the Islands of Goats’ in Italian, is a mountainous archipelago in the Mediterranean Sea, off the northwest coast of Sicily. Composed of five small islands, the group measures 37 square kilometres in total. 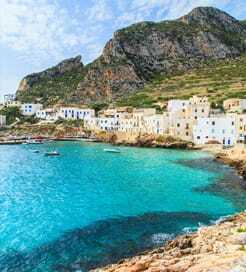 Most accounts record just three islands: Favignana, Levanzo and Marettimo, but the Aegadians actually include Maraone and Formica as well, two tiny islets close to the Sicilian coast. Relatively unknown outside Italy, they have been dated to Palaeolithic times owing to the selection of cave wall paintings on the main islands still visible today, and were under a Genoese family ownership until 1874 when they were sold to the Florio family on Palermo. The largest member, Favignana is butterfly-shaped and well equipped with white beaches and sunbathing spots. Featuring in Homer’s Odyssey, the surrounding turquoise waters popular for diving and snorkelling, with a network of spectacular sea caves such as the Lovers’ Grotto and the Grotto of Sighs; locals claim that moaning can be heard during winter. Watching over the market squares in the main town is the Arab-built, fort tower of Santa Caterina, where you can also find local restaurants serving freshly caught tuna, the primary trade of the Aegadian Islands. Levanzo, the trio’s smallest, has a hilly landscape with more dramatic viewpoints, perfect for photographers, while there are a couple of sandy beaches hidden along the coast. The only village, Cala Dogana contains few amenities but offers two shops, restaurants and hotels, making it one of the more tranquil visits of the island group. 24 kilometres from the Sicilian coast, Marettimo is the most far flung and least visited by tourists. The largest population is, in fact, a variety of seabirds including the European storm petrel and the Bonelli’s eagle. People do occasionally visit for the Aleppo pine-clad walking trails, taking you through fields of thyme, mint and chamomile. 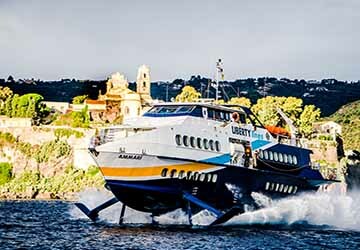 Ferries to the Aegadian Islands depart primarily from Sicily, given the proximity between the two, with up to 15 sailings a day on some routes. Interisland routes are also quick and regular, while there is also a longer crossing from the city of Naples, on the Italian mainland. For more information, please visit our Ferries from Sicily to Aegadian Islands page.